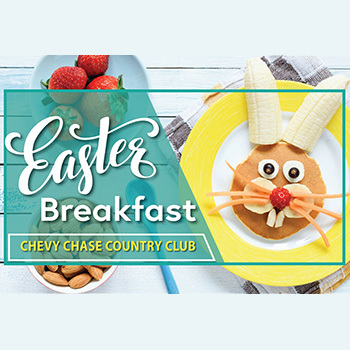 Enjoy a wonderful breakfast spread and visit the Easter Bunny at Chevy Chase Country Club's annual Easter Breakfast in the beautiful grand ballroom. Pre-paid reservations required. Fee: $27.95/adult 17 years+; $12/child 6-16 years; free/child 5 years and under. Admission Fee Adults (17+): $27.95; Kids (6-16): $!2; Kids (under 5): Free.